Dreams are significant. The crossing over of a bridge in a dream may symbolize the transitioning of one state of consciousness to another. Every single moment of life philosophically represents a point of change, the next phase, a mental proposal to self or the expectation of better circumstances to come. Whether we are making small modifications or big shifts, bridges indicate transport as well as motion. While the Earth, Sun, and Galaxy do not, the universe forces us to question what powers infinity and eternity. These are the questions to which the answers are not always so obvious, and the most appreciated realism of the dream may be the acknowledgement that the bridge of everlasting love is the one we build for and within ourselves. Falling deeply and passionately in love – with yourself – has everything to do with creating your best life. Among the most positive of colors that inspire us to feel beloved is the color pink. 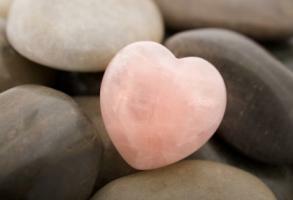 The magic of pink encourages endless compassion and unconditional love. It radiates a warm and undeniable magnetic energy that attracts all things we desire and hope for. Insightful and tender, the sensitive nature of pink puts people in touch with the nurturing side of themselves through either the need to receive – or the need to give. It bestows a sense of security and understanding for the possibility of a positive outcome. Pink denotes admiration, respect, the sweetness of life, and uncomplicated emotions. This gentle color has the ability to make our lives feel lighter, while exuding tenderness and kindness. Whether the goal is to attain more love, self-confidence, success or intimacy, when we are kind and respectful toward ourselves, we feel worthy and deserving of claiming the gifts of this world. The energy of each color is absorbed through our skin, affecting our cells. Over time, studies have shown that the metaphysical effects of the color pink can alleviate feelings of anger, aggression, resentment, abandonment and neglect. Violent and aggressive prisoners have been successfully calmed by simply being placed in a pink room for a specified amount of time. Even the blind are affected by color as their bodies can still register the impact of its energy at a cellular level. Chakras are energy centers that radiate through the body from front to back. Similar to the healing power of natural stones, the visibility and exposure of pink can have a calming effect on the nerves and emotional energies of the heart. The fourth chakra is located in the HEART, the balance between your body and spirit and the hub for unrestricted love. This instinctive chakra governs the heart and circulatory system, respiratory system, shoulders, hands, arms, ribs/breasts, diaphragm and thymus gland. The heart represents the nucleus of love and security, so when it enters an attack [heart or coronary thrombosis], it is divulging its lack of joy and contentment. Thus, hardening and clutching on to strain and stress. When the fourth chakra is blocked, we feel a lack of love and mental stability. When unblocked, we attract people who give us clarity and purpose and our minds are open to loving kindness. The natural color of Lake Retba in Senegal, turmeric flowers, the color of breast cancer awareness, flamingos, carnations and cotton candy, pink is prevailing in all of it’s sensitivity. Feminine and romantic, the color pink often wears well on the male gender. Pink Pearls may symbolize integrity, purity, loyalty and good fortune. These pearls surround us with wisdom and protection and like natural stones, their calming effects balance karma and strengthen personal relationships. The Egyptians, Chinese and Greeks used the restorative power of gemstones very effectively. Life is full of surprises, but only to those with eyes to see beyond the obvious. The bridges in our lives are necessary and are divinely constructed with significant turning points, maps and guiding principles. Life is a process and we live within that process. But a time will come when we can all use a little reassurance. And though life may appear to possess more challenges than advantages, we should learn to keep the negativity in check. A vital bridge of self-discovery is necessary now. This week, think pink and embrace the “love of you.” Your bridge of everlasting self-love will provide positive possibilities to cross-over and discern all that could be. Treat it with the respect it deserves and you’ll end up with a happier heart. A note from the Author: I hope that you have receptively enjoyed the exploration of color psychology during the month of January. It has been just as enlightening for me as it has been for many of you. Here, we explored the significance of colors, their meanings, and how their powerful effects have the intoxicating ability to improve our overall mental, physical and spiritual well-being. I encourage each of you to continue the exploration into the world of color psychology and how it gives meaning to your life.